My childhood was a Hollywood fantasy people dream of, yet it was filled with nightmares. I struggled with food addition and emotional burdens while raising twin daughters as a single parent. I share my story of personal transformation with unconditional faith and finding love by divine accident. A Divine Accident: A Memoir of Life, Love and Learning by Carol Sorkin Hunter is a beautifully written account of the author’s experiences growing up in first New York, then California, as the daughter of famed musician Barney Sorkin. From early on, Carol filled her emotional needs through food, her parents often being too busy to provide simple hugs. Throughout her life, the negative things she experienced were blocked out with sweet treats, ice cream, and chocolate. From her first marriage to a closet homosexual man to finding her Prince Charming, Carol struggled to find inner peace with herself, until discovering the Science of Mind faith and coming to terms with her own emotional insecurities, all the while interspersed with the trials of being a single parent to twin daughters. I am not typically one to read memoirs, but I was pleasantly surprised to be drawn into Carol Sorkin Hunter’s life story. She expertly intersperses her own life experiences with commentary about the time, spanning from World War Two to the attack on the Twin Towers. I was thoroughly impressed with the descriptions of her experience with divorce, at a time when it wasn’t common practice, and how she was granted a second hearing due to using microphones to record her father-in-law admitting to lying in his testimony during the first. Carol Sorkin Hunter truly has had a bountiful and eventful life thus far. I found myself garnering inspiration from her words, having struggled with my own emotional burdens, often resorting to quick fixes in order to provide temporary relief. Her acronyms at the end were wonderful, and I will be using some of them in my own daily life from now on. A Divine Accident: A Memoir of Life, Love and Learning by Carol Sorkin Hunter is not only a brilliant account of a well-lived life, but an example of how we are all in charge of our own destinies, and our own happiness. 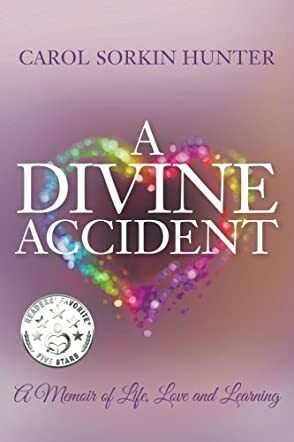 A Divine Accident: A Memoir of Life, Love and Learning by Carol Sorkin Hunter is the author’s memoir and relates her memories of growing up at a time when life was perhaps much simpler and values held much higher. Initially a struggling family, life suddenly gets better when they move to Hollywood where the author’s father obtains lucrative work within the film industry. Carol’s life is cossetted in a prestigious school, with high-class friends, and a world where she thinks nothing of rubbing shoulders with the rich and famous. Her father’s attempts to make a musician of her fail, and she turns to comfort eating until eventually she finds her true calling, and discovers she is a talented artist. Emotionally, she struggles, especially with relationships, until, working with a psychiatrist, she is able to talk about an event that scarred her for some considerable time. This is her journey to find happiness and personal satisfaction, and fulfillment in all aspects of her life. This is a detailed insight into the author’s life through the years, made particularly interesting because of all the well-known celebrities that were a regular part of her life. Such names as Elvis Presley can only add credence to the story and hold the reader’s attention to find out what other well-known names might be mentioned. There is a lot of information, which ordinarily might only be of interest to friends and family, but there is an angle or hook - the Hollywood connection - which makes this a compulsive read, ending with an intimate knowledge of the author, Carol Sorkin Hunter. I like to read a lot of different genres. My favorites are fantasy, science fiction and historical. But every once in a while, I like to read literary work, or a well written memoir. It is great for me when I can find a memoir so well written that it gives me two genres for the price of one. Divine Accident: A Memoir of Life, Love, and Learning by Carol Sorkin Hunter is such a memoir. I found it full of keen insights into everyday life, just like I find in great literary novels. I found myself immersed in a life of privilege as alien to me as the strange worlds of science fiction. I grew up a black man in the deep South, but I found myself relating to someone who grew up among the inner circles of Hollywood. That is a journey. That is quite a stretch; that is good writing. Carol Sorkin Hunter writes well. This is the first criteria on which I judge any book. She has also lived an interesting life, which is the next vital element, particularly when reading a memoir. After all, the plot is her life. The characters are characters from her life. If these things aren't interesting, how can the book be? A Divine Accident is interesting. It is full of insight into the human condition. It flows because Carol Sorkin Hunter knows how to tell her story. It is relevant to all of us, whether we are from California or Alabama, because she has learned. I, for one, am happy she has decided to share her experiences with readers.